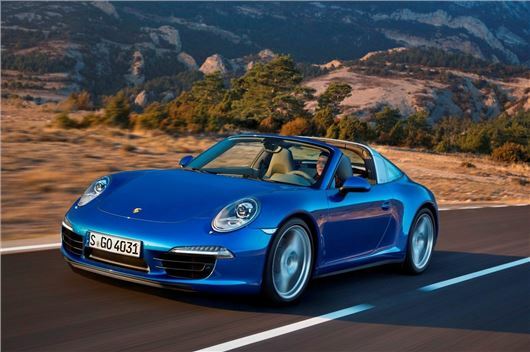 Porsche has announced the new 911 Targa, which bridges the gap between coupe and cabriolet. It has a traditional coupe profile, but the roof section folds away electronically at the push of a button. The Targa is available to order now, priced from £86,281. The first UK cars are expected to arrive in May 2014. The new car features styling cues from its ancestor, which was first seen in the late 1960s. These include a wrap around rear screen with a large glass area and – of course – the removable roof panel. In the original Targa this had to be removed by the driver and manually stowed behind the rear seats, but the process is automatic on the new model. The roof panel on the new car isn’t solid, however. It’s made of fabric stretched over a lightweight frame, with additional sound deadening material to reduce wind noise. Folding the roof takes around 19 seconds and it can only be done when the car is stationary. When the roof is down a wind deflector helps keep buffeting at a minimum, while the roof itself is stowed completely out of sight. This means the cabin is bathed in light through the roof aperture and the large rear window. The window itself is made from lightweight double layer glass and features very fine heating elements to prevent steaming up. The video below shows the roof folding mechanism in action. Porsche is offering the 911 Targa with a choice of two engines – a 3.4-litre, 350PS flat six in the Targa 4 and a 3.8-litre, 400PS flat six in the Targa 4S. Transmission is a seven speed manual as standard, but buyers can specify the PDK double-clutch automatic as an option, along with the performance enhancing Sport Chrono Package. With the PDK and Sport Chrono Package, the Targa 4 can get from 0-62mpg in 4.8 seconds and on to 175mph. Fuel economy is 32.5mpg and emissions are 204g/km. For the 4S the with the same options fitted, 0-62mph takes 4.4 seconds, top speed is 184mph, economy is 30.7mpg and emissions are 214g/km. Order books are open now with the first cars expected in showrooms from May. The 911 Targa 4 costs from £86,281 while the more powerful Targa 4S is priced from £96,316. Standard equipment includes leather upholstery, touch-screen navigation, automatic climate control and bi-xenon headlights. Aside from the more powerful engine, Targa 4 models gain larger, 20-inch alloy wheels, Porsche Active Suspension Management, and Porsche Torque Vectoring with rear limited-slip differential as standard. Additionally all cars get a tracking system, and buyers can participate in a complimentary driving course at Silverstone.